$5 Nano-SIM Card Cutter | OhGizmo! Those SIM cards… God are they annoying. They went from regular SIM cards, to Mini SIMs, to Micro SIMs, and to Nano SIMs, all in the name of ever smaller cellphones. Here’s the thing: most of the time, the smaller ones have the same metal contacts as the larger ones, just more plastic around them. So instead of getting a new card from your mobile company, why not cut your own down to size? 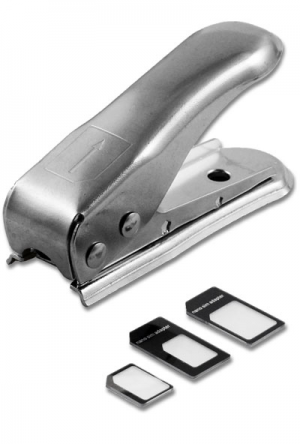 The Nano SIM Cutter takes any regular or micro size and trims the excess off to provide you a precision cut nano SIM. It’s simple, you insert your SIM card with the contacts facing downwards, push the SIM card all the way in, and push down on the lever. The cutter will provide you with a perfectly cut nano SIM card every time! These Nano SIM Cutters are built from hi-quality stainless steel to ensure high precision cutting. It comes with “with Nano SIM to Micro SIM, Micro SIM to Standard SIM, and Nano SIM to Standard SIM adapters.” And yes, it’s $5 on special. ← Is A Ball-Dropping Ability Enough To Make This RC Heli-Drone Stand Out? Swooped SIM cutter, thanks for the info and code.